We pride ourselves in being the Eastside's best Mercedes Service center. 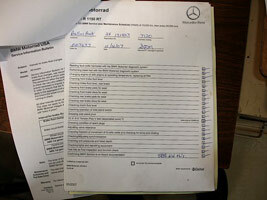 We handle both Mercedes maintenance and inspection services. Let us make your Mercedes service experience as hassle free as possible. Genuine Mercedes parts and accessories are all available at German Car Specialists, Inc. Customer satisfaction is our number one goal. Our well-trained, certified professional technicians will use the most updated tools & equipments to service your Mercedes. Like any machine that achieves extraordinary extremes of performance, your Mercedes-Benz requires regular maintenance. And taking care of your Mercedes-Benz is probably a lot easier and more affordable than you think. When your Model year 1998 and newer vehicles' Flexible Service System indicates it's time for service, take your vehicle to our shop, where our expert technicians perform routine services and maintenance. Generally, you can expect to drive your Mercedes approximately 10,000 miles between services - and as many as 20,000 miles - depending on which model you drive, how you drive it and the severity of your driving conditions. Maximum service intervals may be limited by time duration, depending on how you drive. We classify Required Vehicle Service as A-Service (minor) , B-Service (major) and C-Service (major). All scheduled services are necessary to maintain your vehicle in optimum operating condition and to avoid damage to your vehicle not covered by the warranty. We strongly recommend you take your Mercedes-Benz to our shop for all service work. Reset Flexible Service System,b&gt; (FSS) counter in the instrument cluster. Horn, headlamp flasher, hazard flasher, turn signals. Windshield wipers, windshield washer system. If so equipped: Battery, wet cell; Check acid level, replenish. Check battery condition using "Midtronics MCR 717&Prime; Tester. Change engine oil and renew filter element. - Engine cooling system, antifreeze and corrosion protection. Lubricate catches, safety catch and hinges on engine hood. Check tires and wheels: external condition on both sides, depth of thread condition, tire pressures (including spare wheel), correct sizes. Check steering: steering box, steering linkage, joint disc, threaded connections, freedom from leaks, tension of power steering V-belt. Check seat belts: condition & correct operation..
Read & Print All Diagnostic Codes (Engine and Transmission). Reset Flexible Service System (FSS) counter in the instrument cluster. Brake test on dynamometer or test drive. Check parking brake and run in according to specifications (on vehicles with 4MATIC, ASR, ETS, ESP observe the instructions in Maintenance Manual!). Remove and reinstall wheels, rotate if necessary, does not apply to vehicles with different tire sizes front/rear. Check brake pads for lining thickness front/rear. Check condition of brake discs front and rear. Check tires for damage and condition. Measure and record tread depth. Correct tire inflation pressure. Visual check for: Leakage - Major components. Chafe marks, line routing, components. Check condition of front axle ball joints. Check condition of steering's mechanical components. Visually check: Leakage - Major components. - Level control (wagon only) Brake system. Lubricate throttle linkage, check function and condition. Replace windshield wiper rubber inserts. Inspect headlamp range adjustment of headlamps (NOT for xenon headlamps). Inspect headlamp setting, adjust to correct setting. Inspect condition of wiper blade for the rear window. Inspect fluid level of rear window washer, correct. Correct tire inflation pressure in spare tire. All of the "A" Service and "B" Service. Replace Fuel Filters (gasoline and diesel). Replace the Power Steering Fluid and Filter. Reminder Card for Next Service Needed.